The army section at Pate's Grammar School CCF is badged to the RoyalGloucestershire Hussars (RGH), hence we wear the RGH stable belt. We don't wear the generic CCF stable belt. Very few CCFs seem to nowadays -almost everyone wears the belt of the regiment/corps to which they're badged. The RGH don't exist as a regiment any more. They now form A Squadron of the Royaal Wessex Yeomanry, although each squadronstill retains its own uniform and accoutrements, including stable belts. 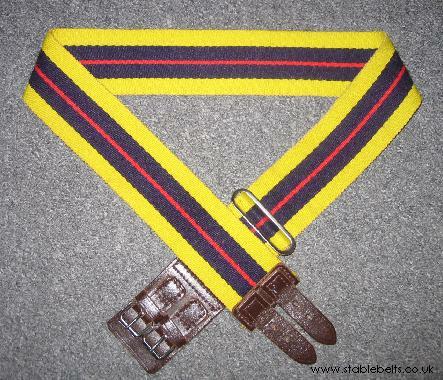 There was an older style of RGH belt which had the same colours, butfastened with the type of buckle you find on 1937/1958 pattern webbingbelts - same as the one, for example, on the RMA Sandhurst belt.Nowadays they all have the usual two leather straps and buckles.